At The Landings, the staff, accommodations, and scenery combine to create an extravagantly pleasant and unforgettable island getaway. There's a genuineness about the staff at The Landings, a pervasive warmth of spirit that will paint your time spent here in bright shades of happiness. Take the water-sports crew, who find ways for even the youngest siblings to have fun. Or the restaurant staff who bend over backwards (with cheerful smiles) to accommodate guests' needs and tastes. Even the "fruit man"—who announces his arrival each day with a blast of his conch shell—dispenses fresh guavas, bananas, and coconuts with an infectious, island-style joie de vivre. Perhaps this pride of work is because The Landings is so brand-spanking new; the first phase just opened in 2007. Or perhaps it's the way each day promises blue skies, fun adventures, and new delights. Currently, just 62 one-, two-, and three-bedroom condo-style residences are strategically placed in waterfront settings. Step through French doors onto your huge balcony each morning to an idyllic view of sailboats bobbing in the harbor. Relax in tasteful and sensuous surroundings; well-appointed kitchens feature Miele appliances and European cabinetry, roomy bathrooms have high-end fittings, and bedrooms lend themselves to restful nights with ultra-comfy beds and soft linens. You and your family and friends also will appreciate the 7,000-square-foot RockResorts Spa, an 80-slip private marina, and water sports concessions that offer everything from kayaks to snorkeling equipment. Spend your days sunning or floating on the tranquil bay under the capable care of the beach- and pool-side wait staff. Or hop on the resort's launch for a picnic and snorkeling trip to Pigeon Island. Choose to make dinner in your residence, or have it catered by the enthusiastic restaurant staff. 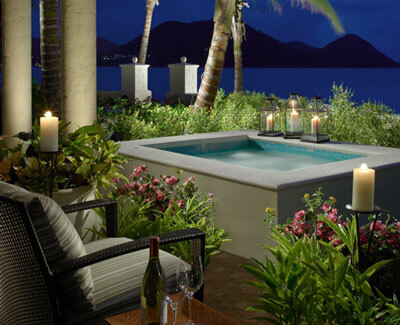 Or simply sit, refreshment in hand, on your balcony or at the beachside restaurant, to savor the dazzling Caribbean sunset.